Apparently, some people have been worried about me since I haven’t posted in slightly over a week. Well, I am indeed alive and actually doing quite well. This past chemo cycle (starting April 5) has left me with the least side effects yet. Here’s a quick rundown of the most harrowing days of this treatment cycle. Day 1: Chemotherapy day. I was mostly symptom-free and full of energy (I’m sure the steroids had some small part in that…). 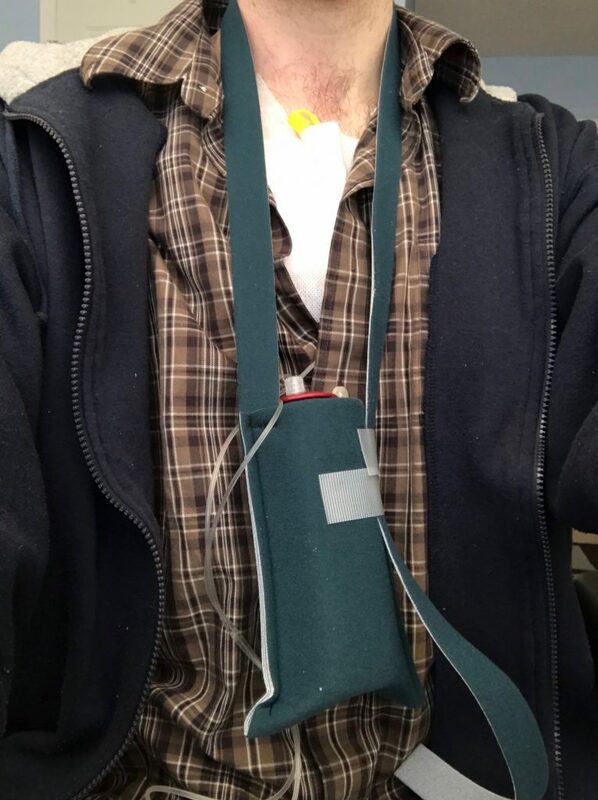 I brought my laptop and got several hours of work done while I was hooked up to the chemo machine. I had a hyperthermia treatment at the naturopath afterwards and was so intent on squashing a “bug” that I had my laptop out again in the naturopath’s waiting room. Day 2: Everyone deserted me! 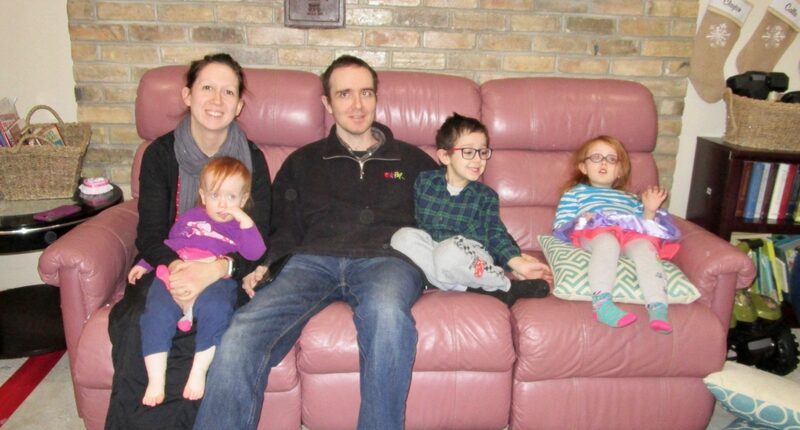 While Leanne attended the Kitchener-Waterloo Christian Home Educators Association conference, her parents took the kids to Jakeman’s Maple Farm for pancakes and a wagon ride and to pet the animals. I still felt well enough to make a peanut butter and banana sandwich and cook a box of expensive organic macaroni in between TV viewing and naps. Day 3: As expected, this was my worst day. I experienced nausea most of the day, including some dry heaving. I managed to eat my daily PB&B but that was it in the food department. I also napped quite a bit. Day 4: I felt better in the morning but not quite well enough to work. I had a smoothie while I watched Stargate and then went off to get my hyperthermia and Vitamin C infusion in the afternoon. Day 5: Back to working full time (at home). I even felt well enough to continue my ongoing project of assembling the girls’ bedroom furniture. I know I didn’t eat a lot on the weekend but somehow I lost 7.6 lbs. I went from weighing 151.8 lbs on the Friday to 144.2 lbs on Monday morning. I may need a new scale. As of today, I am 149.7 lbs. Today is Day 11. Most surprisingly I haven’t had ANY diarrhea yet, which is really weird since diarrhea is a common side effect of my chemotherapy drugs, my antibiotics and my daily Grastofil injections. The only real side effects that I have been noticing are related to my skin. My rash looks like it may be coming back a bit and my skin is very dry. My throat feels a little odd as well, almost like it could use some hand cream. My expensive Lidocaine/Kool-Aid mouthwash is supposed to help with my throat as well. It only bothered me enough to use the mouthwash twice. I really am feeling good. God has blessed us so much. I am happy and content with my life. My cancer just doesn’t bother me, or at least I don’t allow it to. I know it could get worse, but since I can’t do much about it, I figure it’s best just to let the Creator of the universe handle it. Life feels normal again. I am thoroughly enjoying my work. Little Magnolia is a constant delight as she is beginning to talk and smiles and laughs at everything. Our Daisy Kate is nuts which is why I like her so much. She can be a nightmare one minute and a barrel of laughs the next. She seems to be quite the artist for a three-year-old. Harry is learning so much lately and I’m so glad I get to play a small part in it. Even today I had an opportunity to give him a spontaneous multiplication lesson. He is getting more fun to talk to as well; I could use a break from discussing Minecraft though. Please continue to pray for us because it is working! My next chemo treatment is on Thursday, April 18. Please pray that my symptoms continue to be as manageable as this past cycle. Pray that the chemotherapy keeps working so that surgery will be an option. The daily injections weren’t as bad as I thought. My dear wife was gracious enough to give me my daily stabbing as I have not the fortitude of mind to inject myself. I should see if they will let Leanne do my blood tests too because she is much more gentle than any nurse I have met so far. I had to ask Leanne if the needle was even in yet. I suppose a subcutaneous injection is a little different than an intravenous injection (hopefully I used those terms correctly). I passed my blood test this morning. My white blood cell count is up. At the time of writing I am currently hooked up to the chemo machine being pumped full of poison medicine. My weight is now up to 151.8 lbs (thanks to poutine and prayer) which is a nice improvement from my low at 137.0 lbs. It’s now been 4 weeks since my last chemotherapy treatment. It’s been a nice break but I am glad to be getting on with my treatment. Please continue to pray for us. Pray that I recover from this round of chemotherapy quickly. I failed my blood test again today which means chemotherapy is once again postponed until next Friday (April 5th). My neutrophils (white blood cells) are still too low for chemotherapy and in fact are even lower than they were last week. To combat my neutropenia I will need to start receiving a week’s worth of daily Grastofil injections for each chemo cycle. This time I’m only getting five injections instead of seven due to the upcoming chemo treatment being only one week away (the injections must stop 48 hours before chemo begins). I had to pay out of pocket for the first batch of Grastofil (and could have bought two iPads for the same price) but it sounds like the Ontario Trillium Drug plan and the manufacturer of the drug are able to cover at least some of the cost going forward. My doctor did have some positive news for me today. Apparently my blood tests have shown a significant decrease in my carcinoembryonic antigen (CEA) level. CEA is a protein that can be an indicator of cancer, especially colorectal cancer. My CEA level was 887.8 on Jan 23 and has dropped to 123.8 as of Mar 21. The doctor says this is really good and that if this continues we may be discussing the surgical removal of Tony when my chemotherapy treatments are complete. Praise the Lord! I have a CT scan booked for May 23, and hopefully these images show further evidence of healing. Please continue to pray. My number one concern right now is my white blood cell count. I can’t get back on chemo until they climb back to a suitable level. Thank God for this good news. The secret to weight gain is poutine. I tried Costco’s poutine last night for a light after-dinner snack. Those 1400 calories helped me reach a weight gain of 10 lbs. since my low after my second chemotherapy treatment. It’s been three weeks now since my last treatment. For the last two weeks I’ve felt great, had a normal routine, and was able to get lots of work done. Trip planning has helped immensely with keeping my attitude positive. My attitude usually hovers around 99% positive but trip planning has me around 150%. I realize I may not be able to travel due to my less than ideal health related predicament but, for me, planning is half most of the fun. It’s good to have something to look forward to. My next chemotherapy treatment is scheduled for Friday morning but first I have to pass a blood test. Please pray that my white blood cell count is high enough so that I can have my chemotherapy treatment. Lately I have been feeling that I’ll make it to 100 (or at least my original goal of 80). I pray continuously that this is God’s will as well. I haven’t felt this good in awhile. I feel like my old self again. I have been getting lots of work done and have even started planning a trip for Leanne and me for our tenth anniversary. I have no scans or anything to prove it but I am reasonably certain the radiation did its job and shrank Tony. My bowel movements have been less frequent and I haven’t had any rectal pain for weeks now. My weight has been slowly but steadily increasing, up about 6 lbs. since the drop after my last chemotherapy treatment. The antibiotics and cream seem to be helping my rash as it is clearing up slowly. I had a little diarrhea last week but basically none this week. My appetite has been great and my tongue feels fine. My hair seems to be thinning a bit but I think that started before the chemotherapy. I was supposed to start my third chemotherapy cycle on Friday, March 22, but I failed my blood test. My white blood cell count is too low right now so they are postponing my treatment until next Friday (March 29) and reducing the dosage. I really don’t mind having an extra week off from the chemotherapy. I will be having a CT scan after I’m done my third chemotherapy cycle. This will be the first real opportunity to see how the treatments are working. Thank God that I feel great. Please pray that I stay healthy while my immune system is compromised. Pray that I pass my next blood test. Pray that the CT scan will show a miracle! I’ve spent a lot of time on the couch this week watching Stargate SG-1. I’m beginning to think that blending with a Tok’ra would be an interesting treatment option. In addition to Leanne, the kids have been helping take care of me. Harry likes to ensure that my water glass is topped up. Daisy is constantly covering me with blankets and making sure I have a pillow and stuffed animal. Magnolia tries to help too, although her help mostly consists of dumping toys on my lap. I haven’t had a lot of energy, likely due my lack of appetite during the first few days of this new chemotherapy cycle which resulted in further weight loss. I have had my appetite return somewhat in the last few days and expect my weight to reflect this soon. My mouth is mostly healed. It still feels kind of burned or really dry but it is not preventing me from eating solid foods. My favourite food currently is Swiss Chalet chicken, specifically the skin dipped in chalet sauce. A lot of foods don’t really taste like they are supposed to anymore but I am working hard at eating regardless. Days 2 and 3 were still my worst. Thankfully I did not have any nausea at all this time. My diarrhea has been annoying but manageable and not painful. I’m a little hesitant to take much Imodium due to some constipation I had last Friday. During my chemotherapy treatment last Friday the nurse told my doctor about my symptoms. My doctor actually came out to see my rash. It was weird because she just kind of stared at me for awhile without actually saying anything. 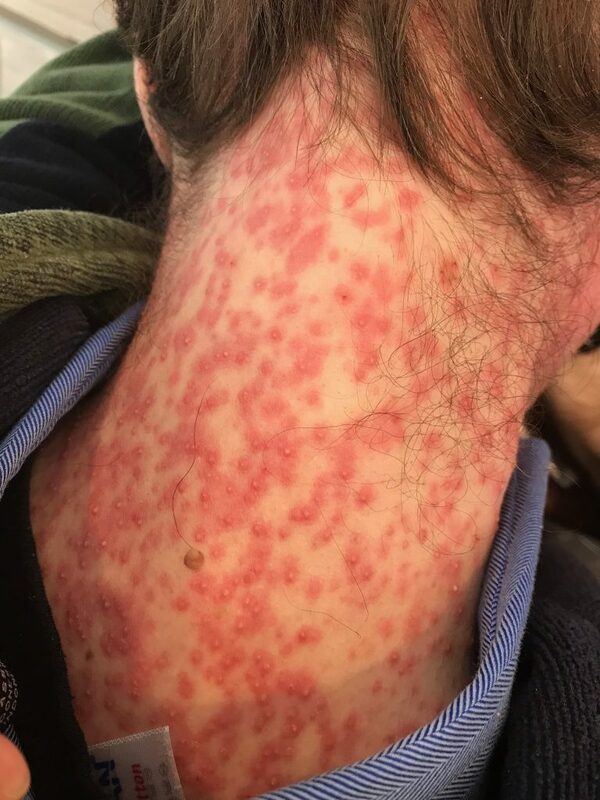 Maybe my rash is really bad or something? It looks worse than it feels. She prescribed me a cream and antibiotics for my rash and a prescription for mouthwash (one of the ingredients being unsweetened cherry Kool-Aid, which I thought was novel although disappointing considering the cost of this medication). I also got a neat skin care product sample kit that is especially for folks who are being subjected to the panitumumab drug. Praise God that I am able to eat solid foods again. Continue to pray that my weight increases. Pray that I get a lot of work done next week before my next treatment as I did not get much done this week. Pray that the chemotherapy drugs will be as effective in attacking the cancer cells as they evidently are in doing other unpleasant things to my body. I am so very thankful to have such a loving and caring wife. She somehow manages to look after me and the kids which she does so well without complaining. My rash has spread to my tongue making eating solid foods incredibly painful. But Leanne is constantly bringing me mugs of broth, filling my water, making me a smoothie at the same time she is wrangling our three kids. She is incredible. I am so thankful to God that Leanne is my wife. My rash does appear to be getting better. It seemed to peak in severity this past Monday. I had a few more cases of painful diarrhea this week. I’m not sure if the Imodium actually does anything. My weight has been decreasing over the past few weeks. It’s been really difficult to maintain it, although surprisingly my weight held fairly steady during my broth diet. Now here’s an impressive number: If you compare my weight in 2009, the year Leanne and I got married, with my current weight almost ten years later, I am almost 70 lbs. lighter. A less impressive number would be to say that I am down about 12 lbs. this month. My appetite has not been too bad but unfortunately I am limited to liquids and soft foods. I am slowly eating more solid foods but it is unlikely that my tongue will have time to heal fully before the onset of the next rash. On a positive note, I managed to get a decent amount of work done this week. Tomorrow I start my two-week chemotherapy cycle again. I wouldn’t mind an extra week or two for recovery between cycles, but I know God will give me the strength I need to do it again. Only 5 more cycles to go. Please pray for my tongue. Pray that it will continue to heal quickly and that it will not be affected so severely during the next chemo treatment. Please pray that my painful diarrhea will become less painful. Please pray that I pack on a few more pounds. Preferably not 70, but 5 or 10 would be nice. Pray for strength. I think I have an idea now of what to expect and I will need God’s help to get through it. On Feb. 22, I had my first chemotherapy treatment. I was sent to a room full of people at least twice my age and was told to sit in a hospital-style recliner. The nurse came over and began explaining how everything would work and how to deal with the many possible side effects of the drugs. Eventually she removed the bandages that were still covering my port and then plugged me into The Matrix my infusion pump. It literally felt like she was plugging a cable into my chest. A cable with a big spike on the end. It was not pain-free. Once all the cabling was attached, she finally left to get the drugs. When she came back with the drugs she was wearing almost full hazmat gear–well, a gown, gloves, and huge face shield. A few thoughts went through my mind at that point. Thoughts like: If this stuff is so dangerous then should you really be injecting it into my chest a few inches from my heart? And where is my protective gear? If a spill were to happen I’m pretty sure more people besides the nurse would be in range. About three hours later the first part of chemotherapy was finished. The final drug was attached to me via a device resembling a baby bottle which would slowly release the drug over the next 48 hours. I did not sleep well that first night. Before the chemotherapy I was instructed to take some medication, one being a type of steroid. The nurse said it might make me feel “on edge.” Not sure what that means, but I didn’t feel “on edge,” just “a-wake.” I still felt well enough that morning to go to my first hyperthermia treatment. It was fairly relaxing. 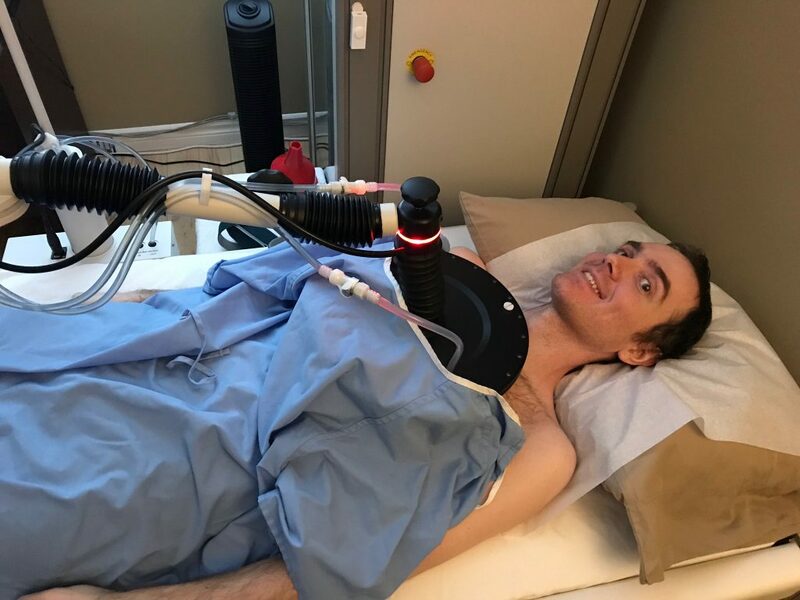 I felt cramps in my bowels every 15 minutes or so (unrelated to the treatment) and I did not like the amount of pressure that was needed for the probe to make good contact with my skin, but otherwise it was ok. Leanne stayed with me the whole two hours and read a book. The nausea started. I dry-heaved a couple times early in the morning, but no vomit. I took my anti-nausea medication and spent the morning watching Star Trek (TNG) on the couch. The nausea medication wore off early afternoon just in time for some more dry-heaving. The home care nurse then came by to detach my baby bottle. I did not feel like doing anything other than sleeping, so that is what I did for the rest of the day and through the night. A most significant event occurred this day: I actually had a shower. 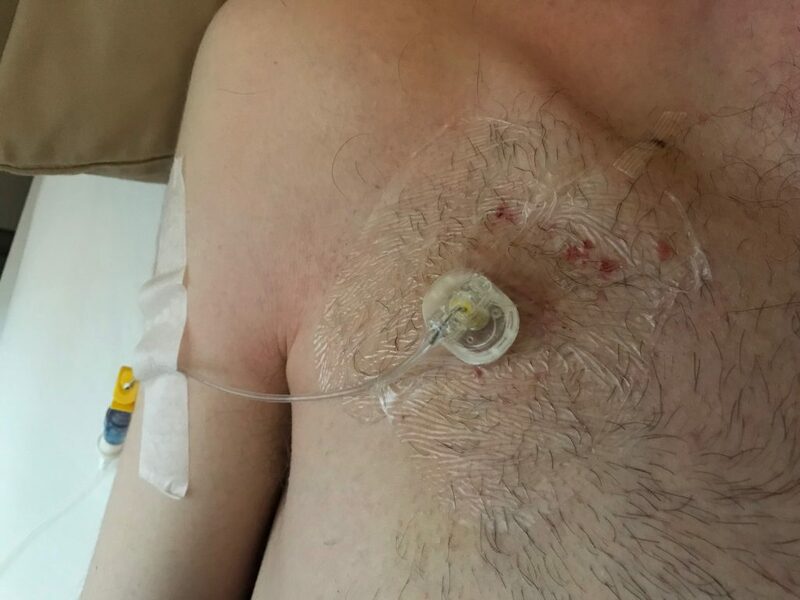 The port installation had prevented me from showering my entire body. Now with the dressings removed and no baby bottle to worry about getting wet, I thought I should make myself clean for my second hyperthermia treatment later that morning. The second treatment was a little more boring than the first and felt longer. I did catch up on Albert Mohler’s podcast. I spent most of the day on the couch watching Star Trek and then moved on to Stargate SG-1. I almost felt like I could be working but I was scared that the nausea would come back or something worse. I couldn’t sleep for some reason that night so I got up and had some left over Swiss Chalet at 4:30 in the morning and listened to the newest Adventures in Odyssey album. 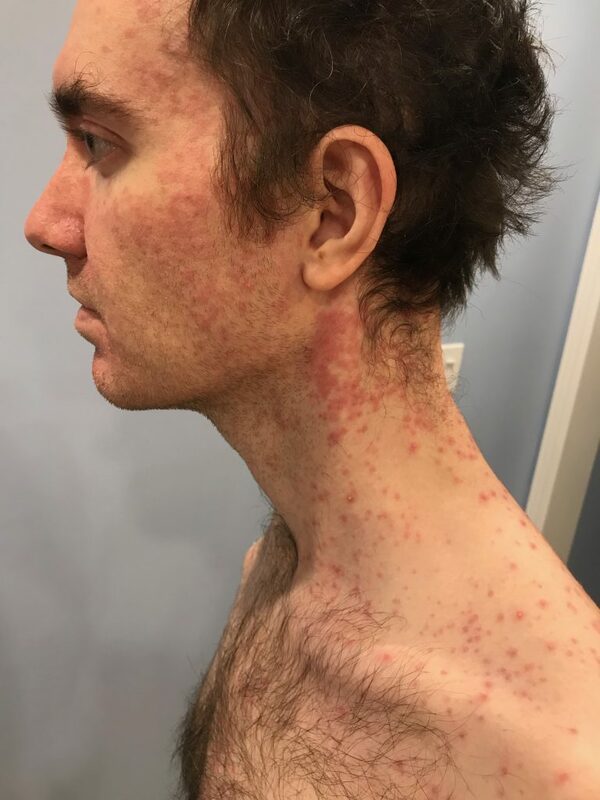 A rash started on my face near my temple and spread to the rest of my face, neck, back and chest. It is a little itchy but it did not prevent me from working a good portion of the day. I felt fine until the evening when the diarrhea started. I was still feeling the effects from the radiation and that mixed with diarrhea made for a rather unpleasant and somewhat painful experience. I took the recommend Imodium and went to bed as soon as I could. I slept in pretty late but worked all afternoon. My rash was still annoying but bearable. My mouth and tongue were beginning to feel like I had burned them by drinking something hot–not a big deal, but it made it a little uncomfortable to eat harder foods. I had been diarrhea free all day but then it hit me again around the same time as the previous day. This wiped me out for the rest of the night. I managed to work basically all day. I felt a little tired but otherwise pretty good. I have been eating better. I eat VERY slowly for some reason but I am eating. My face feels a little sore but manageable. It doesn’t look like the previous nights’ pattern is continuing as I have had no diarrhea yet today. Please continue to pray for my chemotherapy symptoms. I’m entering the days where my immune system will be at its weakest. Please pray that the three little germ factories I keep at home won’t get me sick. I’m still alive. The radiation symptoms have been in full swing this past week. I have been frequenting the toilet rather often and have been going to bed a little earlier than normal but otherwise I feel fine. Unfortunately I was unable to work many hours this week. 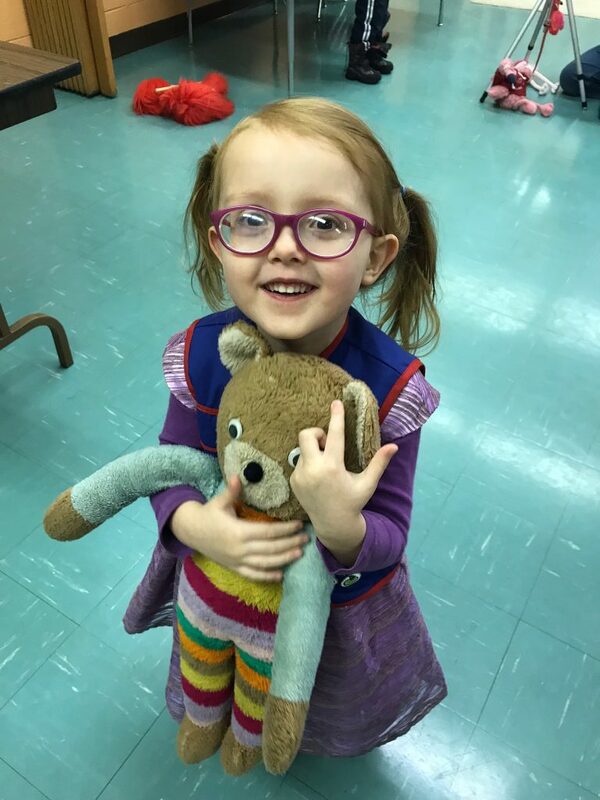 I also didn’t make it to the AWANA Cubbies’ Teddy Bear Picnic at church. Since I couldn’t be there Little Daisy decided to bring my bear, Joe Bear, to the picnic. Friday, Feb. 22 at 9:20am is my first chemotherapy treatment. I’m not looking forward to the possible side effects. Adding diarrhea to my already painful bowel movements does not seem pleasant. I met with the naturopath again today and signed up for the loco-regional hyperthermia treatments and also vitamin C and mistletoe injections. In my opinion there seems to be a reasonable amount of data showing that these treatments may help my situation. My first hyperthermia treatment is scheduled for this Saturday morning and the next one on Monday, where I will also receive my vitamin C and mistletoe injections. The hyperthermia doesn’t sound too bad. I get to lie on my back for two hours while a machine uses radio frequencies to heat up the cancerous parts of my body. This is supposed to make the cancer cells more susceptible to the chemotherapy drugs. The vitamin C and mistletoe may help reduce my chemotherapy symptoms and the vitamin C could even slow down the cancer. Please pray that these supplemental treatments will help ease my chemotherapy symptoms. With God’s help we made it through radiation week. During my last session the radiation therapists asked me if I was going to celebrate being done with radiation. The thought of celebrating never entered my mind. I would prefer to celebrate a CT scan showing the cancer disappearing. Better yet, I hope to be able celebrate when the baffled doctors tell me that my cancer is completely gone and they have no idea why. Radiation was only the first treatment but I am thankful to God for getting me through. I think I have finally started experiencing symptoms. My bowels constantly feel like my diet consists solely of chilli peppers. Ibuprofen to the rescue. Please pray for my symptoms and thank God for getting me through radiation week. I met with my medical oncologist yesterday and she said that the genetic mutation tests came back normal and there were no hereditary markers. (Apparently that’s a good thing. Praise the Lord!) She is going to start me on three chemotherapy drugs late next week. I will be having a treatment every two weeks for the next three months. The most common side effect will likely be diarrhea. It may only last a few days or may be the entire treatment cycle. There are many more exciting possible side effects like nausea, hair loss, rashes, etc. If I go bald, I already have a great art project in mind for the kids called Decorate Daddy. Please pray that the chemotherapy will be very effective, with minimal side effects. On Thursday, a home care nurse came to our house to change the bandages on my port incisions. Even with my partially shaved chest it still hurt when the bandages came off. I really liked the nurse though. She asked me how I was coping with everything and I told her, “My faith.” I told her I am a Christian and that God is in control, and that I have lots of support from my family and church families. I think I mentioned that I am hoping that God will heal me and that’s when she started talking about miracles. She told me a story about a stage 4 cancer patient last year who went from giving up on living to basically being healed. What changed? People started praying. I love hearing healing stories about stage 4 cancer patients; the “0% curable” thing really makes them that much more miraculous. The most encouraging thing the nurse told me is that she sees a few miracles per year. I had never heard anyone try to quantify the number of miracles before. Pray that I will be one of those miracles. Fun fact: It turns out that my home care nurse is actually one of the nurses that looked after my Dad as well. Actually, we almost had the same medical oncologist too, but the one my Dad had moved away and I now have his replacement. They assume my tumour has been growing for the past 5 years, which means if I had known about my cancer earlier, my Dad and I could have been cancer buddies and maybe had father/son chemo sessions. That could have been fun, right?